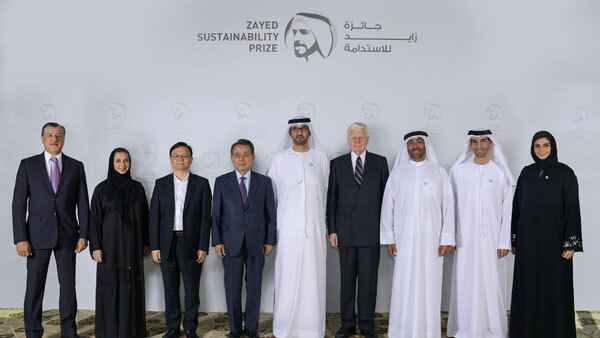 BYD is proud to announce its founder and Chairman Wang Chuanfu has participated in the selection of 10 winners for the 2019 Zayed Sustainability Prize. Established in 2008 and formerly known as the Zayed Future Energy Prize, the annual award recognises companies, schools, non-profits and non-governmental organisations around the world, in honour of the sustainability legacy of the United Arab Emirate’s founding father, the late Sheikh Zayed bin Sultan Al Nahyan. Mr. Wang Chuanfu (third from the left), Chairman and founder of BYD, together with the remaining members of the Prize Jury. This year, Mr. Wang’s appointment to the jury panel coincides with a decision by the Prize to expand its strategic focus beyond renewable energy to include health, food and water. At the same time, the Prize is retaining its Global High Schools category. Together with the other Prize Jury members, which included a number of former world leaders, UAE ministers, and similarly renowned international businesspersons and philanthropists, Mr. Wang assessed the community impact of various sustainability solutions from around the world. The winners will be announced at the Prize’s annual awards ceremony on 14 January 2019. Since its establishment as a maker of renewable energy batteries in 1995, BYD has expanded its operations to include the manufacturing of new energy vehicles for private, public and industrial use, electronics, affordable solar and energy storage system, as well as rail transit. During this time, BYD has won accolades for its sustainability efforts. Four years ago, Mr. Wang was presented the Lifetime Achievement Award for his leadership and achievement in boosting global sustainability. In 2016, BYD was recognised for its innovation by the Prize and won the Large Corporation Award. In late 2017, a solar powered skimmer boat co-designed by students from Shenzhen Yadi School, a middle school established by BYD and Shenzhen Middle School, won a nomination in this competition as well.